A compelling singer-songwriter, a master of the mandolin, lap slide and more, Dwight Mark is a revelation to those who haven't heard him. If the ocean's relentless power had blended David Lindley and Ben Harper, and maybe the saltiness of Gregg Allman, the shorelines might echo with the sounds of Dwight Mark. "Playing with Dwight live and in the studio was a pleasure and a lot of fun. I would strongly urge anyone to open up their ears and hearts and give this talented singer/musician/songwriter a listen. You won't be sorry"
Dwight Mark is a rare, talented musician. He's an accomplished multi-instrumentalist, and as a singer-songwriter, he's soulful, folky and rocking at the same time. His voice spans genres effortlessly and his storytelling talent is sharp and lyrical. Soul's Engines is as solid an album as I've heard in years, full of memorable hooks and lyrics, and deserves to propel Dwight into the national ranks of performers." Anyone who has listened to Dwight Mark’s music knows that it is a window to his soul. In Soul’s Engines, Dwight takes us on a tour of his hopes, dreams, past, and future, much in the tradition of his earlier album, Good Thing. Most of the songs on the new album bring out a “Yeah, I’ve been there too” response that leaves the listener feeling like they have just spent an evening with an old friend. The music that Dwight creates is a solid mix of sage lyrics, artful composition, and top-shelf instrumental support. In Soul’s Engines, he comes across as equal parts Jimmy Buffet and Gregg Allman – sometimes lyrical, often mournful, frequently growling. Dwight mixes the soulful sound of his vintage Weissenborn Hawaiian slide guitars with familiar timbre of his classic Gibson mandolins, backed up with an ever-changing eclectic ensemble of guitars, percussion, piano, accordion, bass, and an array of other instruments. Anyone who likes to take life’s back roads owes it to themselves to give Soul’s Engines a good long listen. 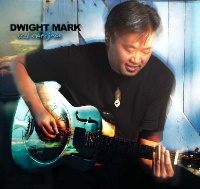 "Dwight's clever and accessible songwriting coupled with performances on slide guitars and mandolins are reminiscent of John Hiatt with Ry Cooder or Jackson Browne with David Lindley"
Dwight Mark's CD "Good Thing" is a winning mix of great songwriting, personal yet accessible lyrics, and ringing acoustic & electric textures all supported by heartfelt vocals. A variety of string instruments, including mandolin and lap steel, are used to rich effect and his mandolin playing in particular, stands in contrast to its usual staccato role in bluegrass. This is a strong recording deserving of a wider audience. Good Thing - great songwriting and musicianship which walks between the lines of pop music and his acoustic roots. No gimmicks here, just a good solid performance and production from a multi-talented musician: composer, poet/lyricist, singer, and instrumentalist, and his musical buddies. Let's hope Dwight doesn't take this occasion to rest with his well-deserved laurels, but gets to work soon on giving us more "good things." I have been playing Dwight's new CD constantly and as they say, this set of music has "Legs" and we will count ourselves lucky to keep hearing this and more from a truly gifted singer songwriter. Yo Dwight - Great site! (www.dwightmark.com) You seem to be afflicted with the same disease I have.. I love to change things around on instruments and string them up different. It's truly fun to do and sometimes one can come up with a real monster. Keep up the good work!